Wish you could carry your gadgets and charge them too? Soon you will be able to do just that. Starting October 2012, Timbuk2 will sell two new bags that will provide much-needed power on the go. In order to make this possible, Timbuk2 partnered with Joey Energy, and will integrate the Joey T1 charger into its two new bags: the Power Commute and the Power Q. While there’s no lack of mobile chargers, this one comes in a bag that the company says is both water resistant and self-cooling. The Joey T1 is supposed to provide up to 2 full charges for most standard cell phones, and should charge almost any device that charges over USB. This includes cell phones, tablets, music players, cameras, e-readers, and GPS units, to name a few. It sits comfortably in its own dedicated compartment, with ports to thread the charge cables through, which means you can charge your devices while they’re lying safely in their own compartment. 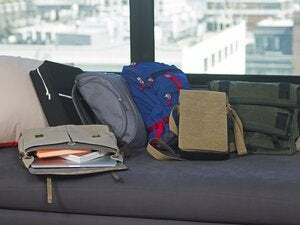 The Power Commute messenger bag and the Power Q backpack are both capable of carrying all your gadgets in their many compartments, and can also fit most 15-inch laptops and 17-inch MacBook Pros, which might be the only device in your bag the T1 won’t be able to charge. Both bags will be available for $199 on the Timbuk2 website starting in October. While they’re quite pricey for a bag, having your precious gadgets never run out of juice can sometimes be priceless. Is a Timbuk2 Power bag something you see yourself buying?